Comments: A great Pac-Man clone - the same as Bandai Packri Monster. 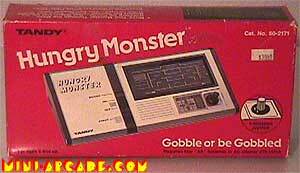 For some reason, the instruction manual calls the ghost monsters 'bogeys'. Tandy also released a version called Ogre Eater (mostly seen in the UK).